1993 Ford SVT Mustang Cobra. Image courtesy Ford Motor Company. 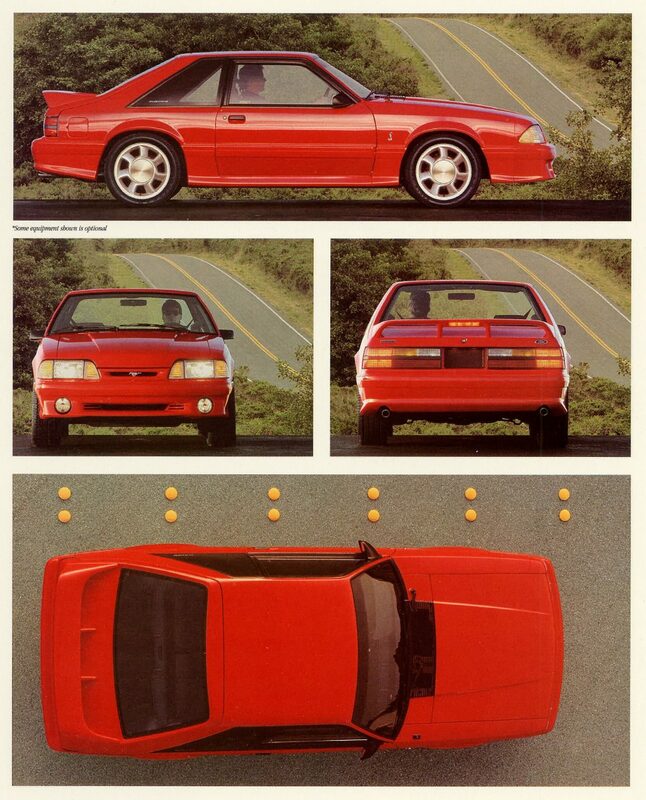 In 1993, with an all-new Mustang set for introduction the following year, Ford did a most improbable thing: After forming a group of enthusiast employees and top-tier suppliers called the Special Vehicle Team (SVT), the automaker revived the Cobra name for use on a limited-production, high-performance Fox-body Mustang. First shown at the 1992 Chicago Auto Show, the original 1993 Mustang SVT Cobra celebrates its 25th anniversary in 2018, and its success gave rise to a performance legacy that carries on to this day. The 1979 Ford Mustang Cobra. Photo courtesy Ford Motor Company. The Cobra name was last used on an American Mustang in 1981, though Canadian buyers could still check the option box for a Cobra package from 1984-’92. By then, however, it was more flash than substance, a bitter reminder for true believers of the ghosts of performance Mustangs past. 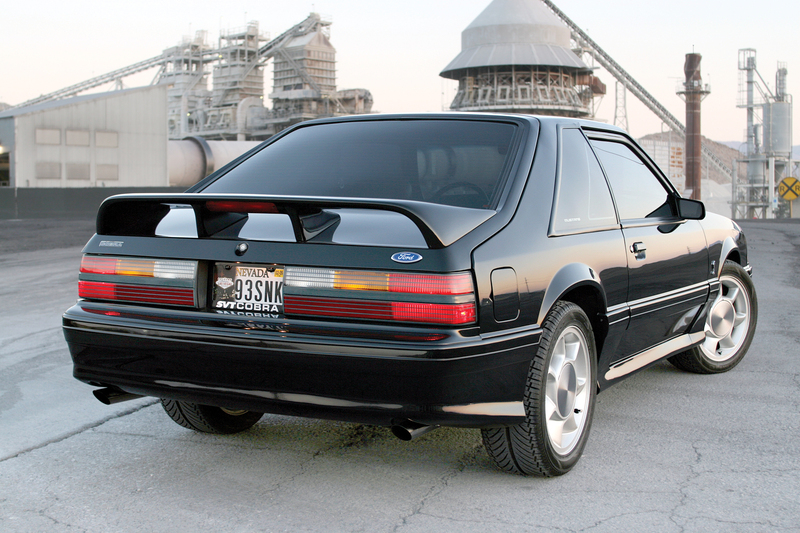 That meant the announcement of a new Cobra Mustang to send off the Fox body was likely met with cynicism by some, expecting little more than flashy graphics and a logo-bedecked interior. 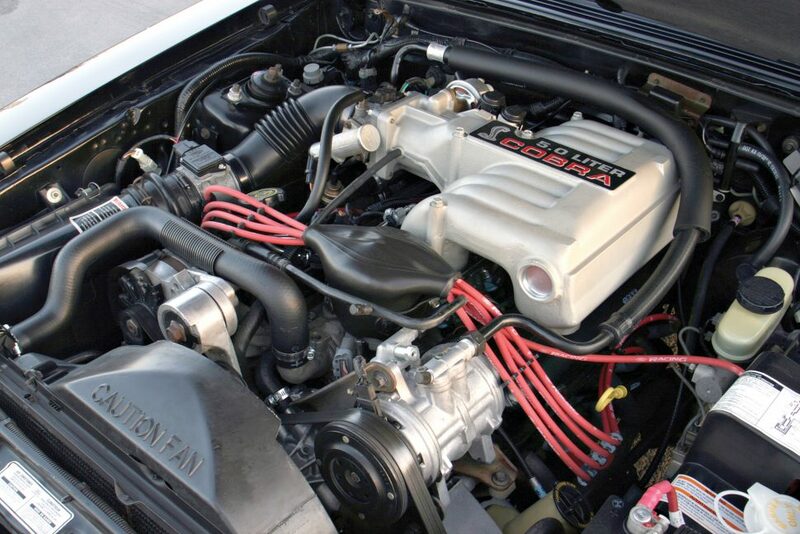 The Cobra’s 5.0-liter V-8. Photo by Jeff Koch. SVT had other ideas of what a Mustang Cobra should be. Starting with the 5.0-liter V-8 beneath the hood, the team added GT-40 cylinder heads from Ford’s Special Vehicle Operations (SVO) catalog, gaining better breathing through larger intake and exhaust ports and valves. Upper and lower intake-manifold castings used larger runners, sending air to a bigger throttle body and air-mass sensor, and, ultimately, feeding the fuel/air mixture through larger injectors than those used on the Mustang GT. The Cobra’s valvetrain used Crane roller-rocker arms and a specially ground camshaft, and even crankshaft and water-pump pulley diameter was reduced to gain a few more ponies. The end result was a conservatively rated 235 horsepower and 280 pound-feet of torque, an increase of 30 horsepower and 5 pound-feet over the GT. The driveline was beefed up slightly as well, with a new clutch assembly and phosphate-coated second and third gears in the Borg-Warner T-5 transmission. A hardened driveshaft yoke transferred torque to the rear wheels via a limited-slip differential with a 3.08:1 final drive, compared to the 2.73:1 standard (or 3.27:1 available) final drive in the Mustang GT. The net result was a 0-60 mph time of 5.9 seconds for the Cobra, on the way to a quarter-mile in 14.4 seconds; Mustang GT owners could expect the 0-60 mph dash to take 7.9 seconds, on the way to a 15.9-second quarter-mile. Underneath, the Cobra received disc brakes in all four corners, instead of the front discs only, employed on the GT. Adopting a philosophy SVT called “controlled compliance,” the goal of tuning the Cobra’s suspension was to improve cornering and braking without compromising ride quality. “Stiffer is better” was thrown out the window, and the Cobra received a smaller front anti-roll bar and softer rear springs than the GT. It also received 17 x 7.5-inch aluminum wheels shod with Goodyear 245/45ZR-17 performance tires, at that time the largest combination ever fitted to a Mustang. Wheels aside, the exterior styling differences between the Cobra and GT were subtle, with the former receiving an open grille (complete with galloping pony badge), revised side sills, rear fascia, SVO taillamps, and a unique rear spoiler. Instead of the GT’s 5.0 logo on the front fender, Cobra models received a coiled snake, and the rear hatch wore a subtle Cobra badge. Its appearance was designed to please a more refined buyer, and with the new Mustang just months away, spending money on revised sheetmetal made no sense. 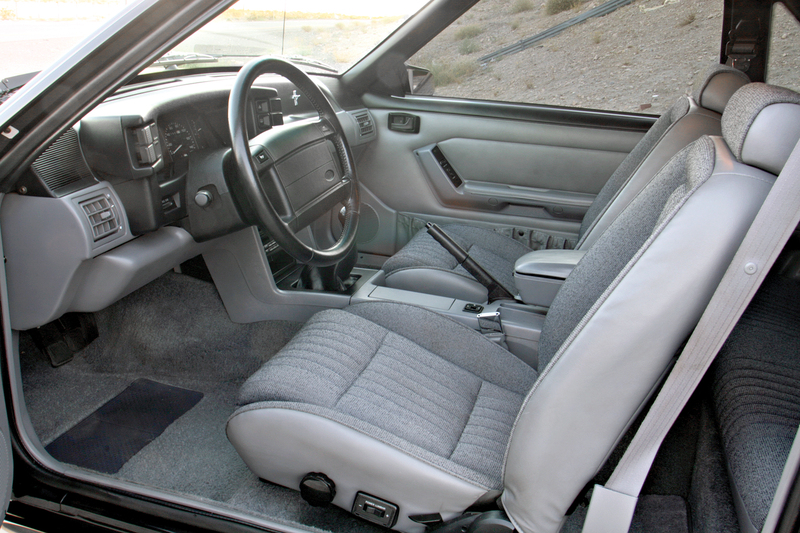 Updating the interior was a no-go as well, so the Cobra got by with the GT’s components and upholstery. SVT Cobra brochure image courtesy of the Old Car Manual Project. Ford offered the 1993 SVT Cobra in Vibrant Red, Teal Metallic, and Black, and the car could be ordered with a range of accessories that included leather seating, a power driver’s seat, a flip-open air roof, and an AM/FM/CD audio system. Base price for the Cobra was $18,505, compared to $16,187 for the GT hatchback. 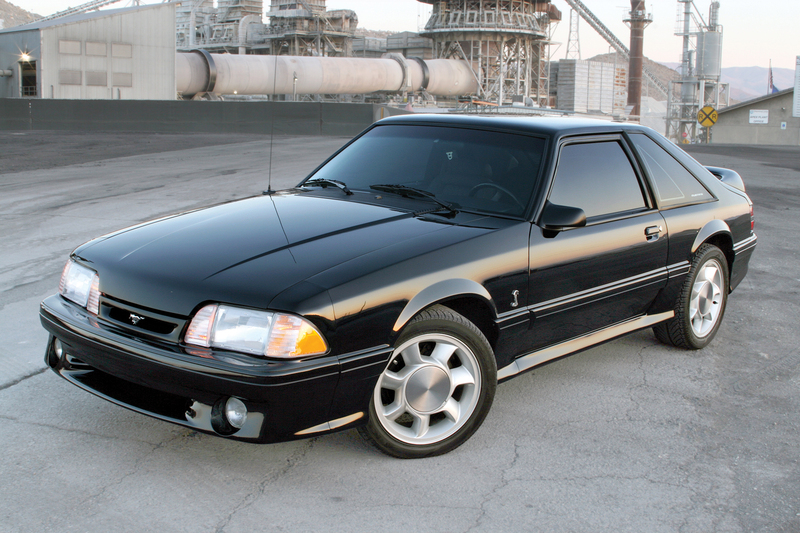 A total of 4,993 Cobras were built in 1993, but SVT had one more trick up its sleeve: the Cobra R.
1993 Ford Mustang SVT Cobra R, offered by Mecum Auctions at its 2017 Kissimmee sale. Built to compete in IMSA Firestone Grand Sport and SCCA World Challenge racing, the Cobra R received a firmer suspension with Koni shocks, improved engine cooling, better brakes, and five-lug wheels. Since output remained the same as the Cobra, weight reduction became the key to added performance, and the Cobra R omitted features like air conditioning, power windows, a back seat, sound deadening, and fog lamps to shed 60 pounds from the Cobra’s 3,255-pound curb weight. All 107 Cobra R models were finished in Vibrant Red with black wheels and a gray interior, and stickered for $25,692. 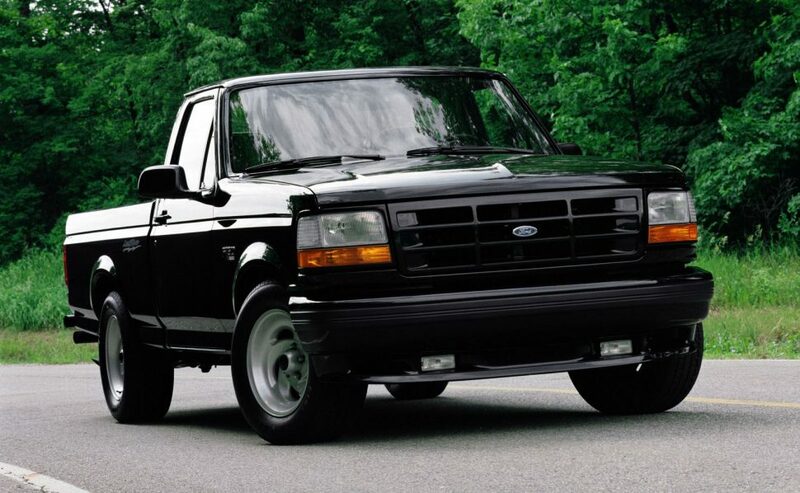 1993 Ford F-150 Lightning. Photo courtesy Ford Motor Company. 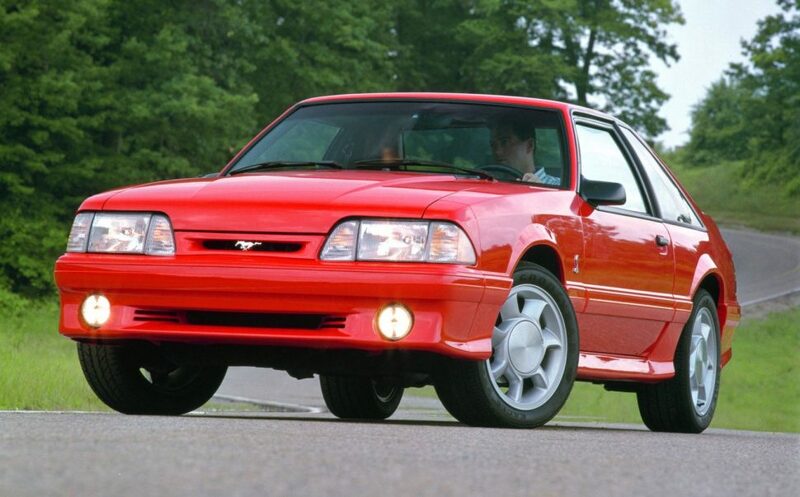 SVT also released the first F-150 Lightning muscle pickup in 1993, and has since collaborated on projects like the later Mustang Cobra and Cobra R models, the SVT Focus, the SVT Contour, the Ford GT, the Shelby GT500, the Shelby GT350, and the F-150 Raptor. The genesis of the division came with the most unlikely of Mustangs, one worth celebrating even a quarter-century later.